Today’s gardeners, if they have the right conditions, can grow plants that came originally from all corners of the world. That’s thanks in large part to visionary, pioneer plantsmen like Hugh Armytage Moore of Rowallane. This garden is his legacy and to wander here, is to take a world tour of plants! The walled gardens are large enough to have trees that form a gracious backdrop to the smaller plants. It’s a garden to take your time in, to wander and to sit and contemplate the amazing variety of plants. That seat did look inviting.. but, unfortunately, a to sit there was not possible in the rain! The lawn area framed by plants. 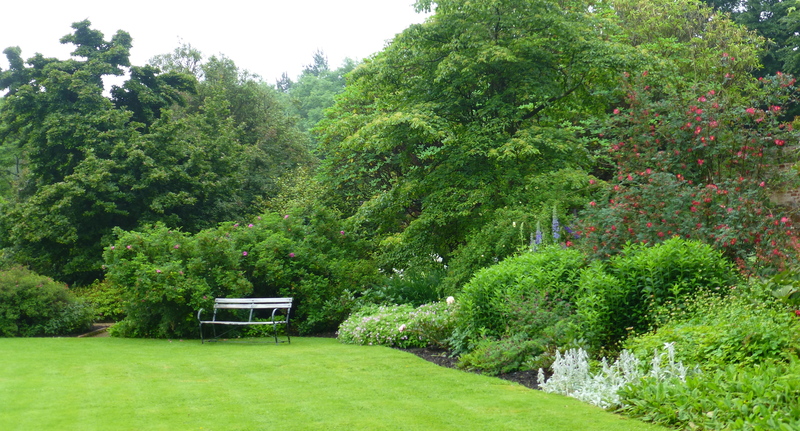 The central lawn area gives this garden an openness, a space. It allows you to not only enjoy each flowering plant up close, but also to see them further away in their setting against the trees. And looking through these spaces is an invitation wander along more paths, to explore further. There are so many plants that captured the eye like these Rogersias with their panicles of flowers rising above strongly veined leaves. Rogersia leaves are as photogenic as the flowers themselves! The flowers of Rogersia come in various shades from red to pink, and cream to white except for Rogersia nepalensis which are a greeny yellow. 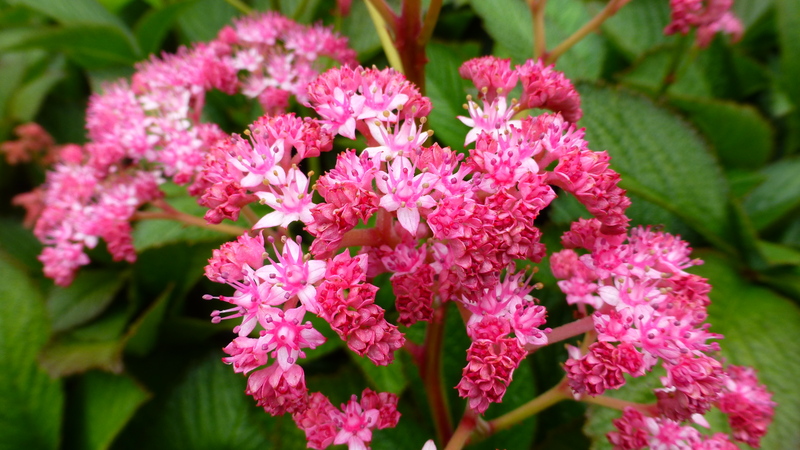 This is yet another plant that comes originally from eastern Asia, most species being found in China, Tibet and Nepal. In their native habitats they thrive in soil that never dries out, growing by streams and in shady moist woodland. No wonder they grow well in Ireland! Grouping different colours of Rogersias together makes quite a show. They are indeed a very handsome plant. Another plant that I hadn’t encountered before is the Giant Knapweed, Centaurea macrocephala. These are rather tall plants, up to one and a half meters, with flowers on ram rod stiff stems. They are very hard to miss! The shaggy-headed, yellow, thistle-like flowers emerge from their bracts in early summer through to late summer. In the wild, the many species of this genus, Centaurea, are found only north of the equator and mostly in the Eastern Hemisphere, particularly in the the Middle East. Although the yellow flowers were fascinating, it was without doubt, the balls of sculptured, glowing bronze balls of bracts that really attract attention. They add such an interesting textural component to the garden and, I’ve no doubt, look very good dried in flower arrangements. The species name of this particular Centaurea is macrocephala and that’s derived from two Greek words: makros meaning ‘large’ and kephale, meaning ‘head’. Very apt. When researching this plant in the horticulture literature, I learned that the botanical name for this plant, Centaurea, comes from the name of a noble mythical Centaur, Chiron. I searched further. It appears that, in Greek mythology, this centaur, half- man and half-horse, taught music, horse skills, hunting, martial arts and medicine to several of the great Greek mythical heroes. He is credited with inventing medicine. And in one story, Chiron cured a festering arrow wound, in one of said heroes, by covering the wound with the flowers of a plant from this genus. 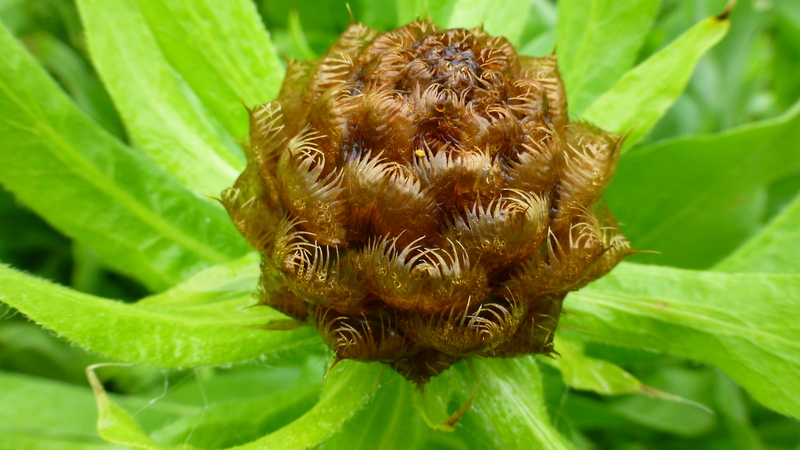 And for that, the genus not only got its name, Centaurea, but also its reputation for having great healing properties. I wonder if modern medicine has discovered this! There are many species of Centaurea. Another one growing in this garden is the lovely blue cornflower-like Centaurea montana, with its solitary fringed blue flower with a reddish centre. The natural habitat of Centaurea montana is, not surprisingly, in mountain areas, particularly in the more southerly mountain ranges of Europe where I have seen it in the wild. It has also become established in the wild in the UK, Scandinavia and North America, but in those places it is as a ‘garden escapee’. It has several common names, including perennial cornflower, mountain cornflower, bachelor’s button, montane knapweed or mountain bluet, so once again, the botanical name is the most useful descriptor. It’s very similar to the more commonly known and grown blue cornflower, Centaurea cyanus. 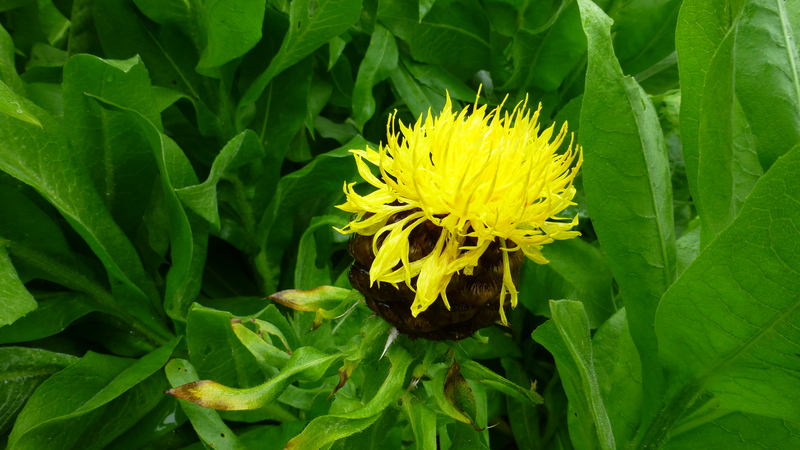 The difference is that Centaurea montana is an evergreen, perennial plant that has a reddish centre and just a single flower head (rarely three). 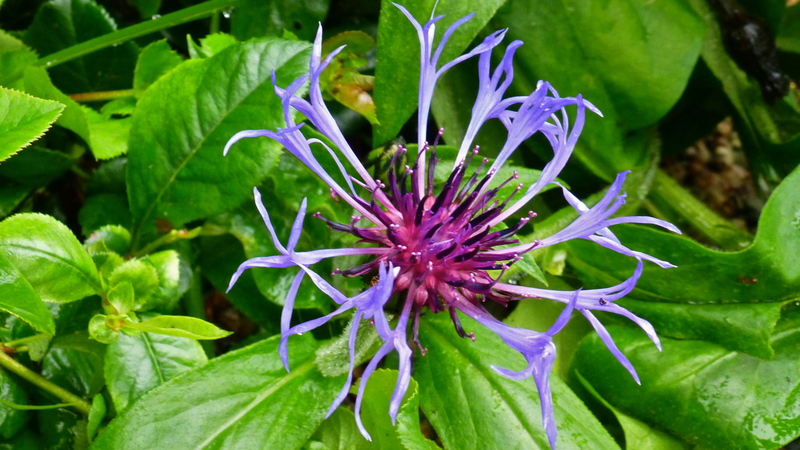 By contrast, Centaurea cyanus has many flower heads, is blue in the centre and is an annual. The blue cornflower, once a common sight in cornfields, hence its common name, is now, as a result of modern farm practices, rarely seen in the wild although it is widely grown as a garden plant. In this garden of uncommon plants, Centaurea montana prevailed. 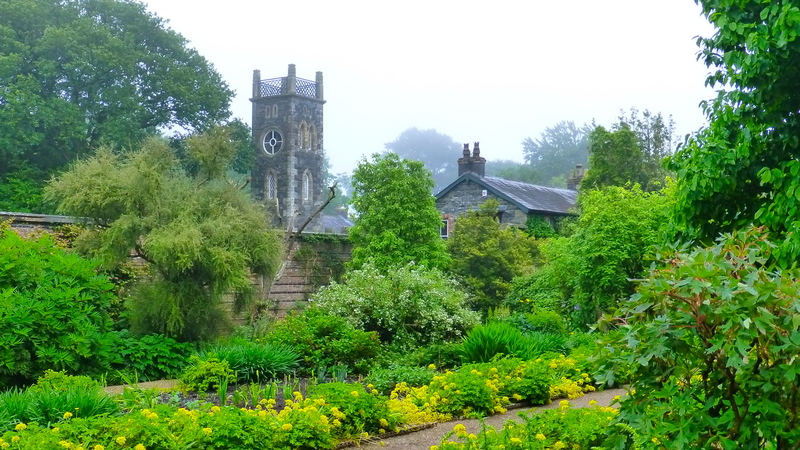 The tower of the old stables is always a focal point in this garden. 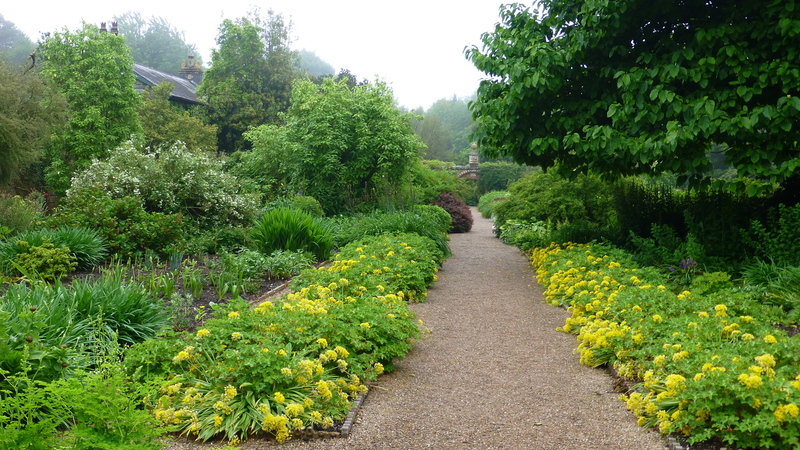 The yellow flowers bordering the path here are Golden Garlic, Allium moly. 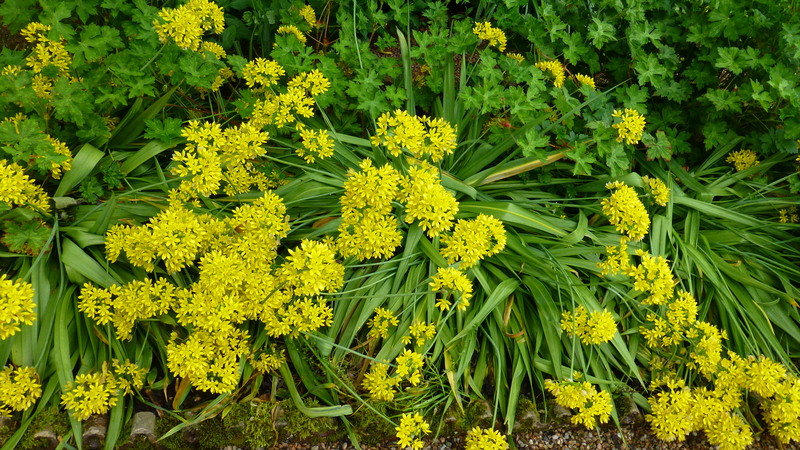 That bright yellow of Golden Garlic, Allium moly, made quite a statement bordering the main path back to the bottom entrance arch, yet another focal point in the garden. This perennial plant, also sometimes called Lily Leek, is primarily found in Southern France and Spain. This was another plant in the garden that had a ‘name plate’ with information notes. From that we learned that the bulb of Allium moly is edible and is used for some medicinal purposes. 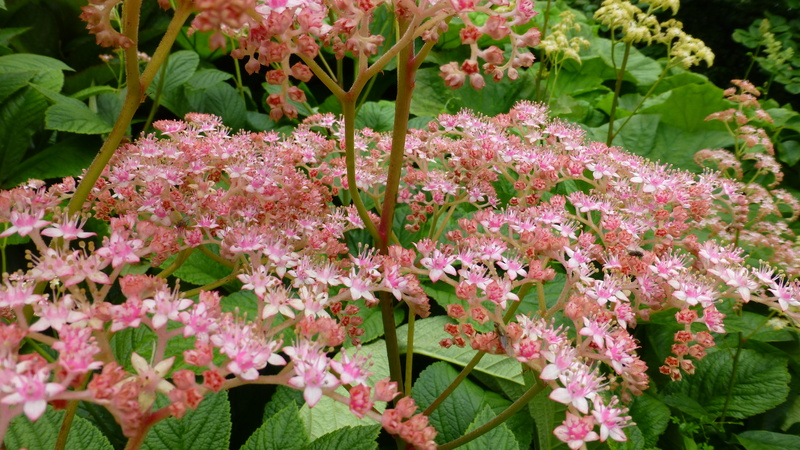 It is used in this garden as a long-lasting, wonderful sunny border. 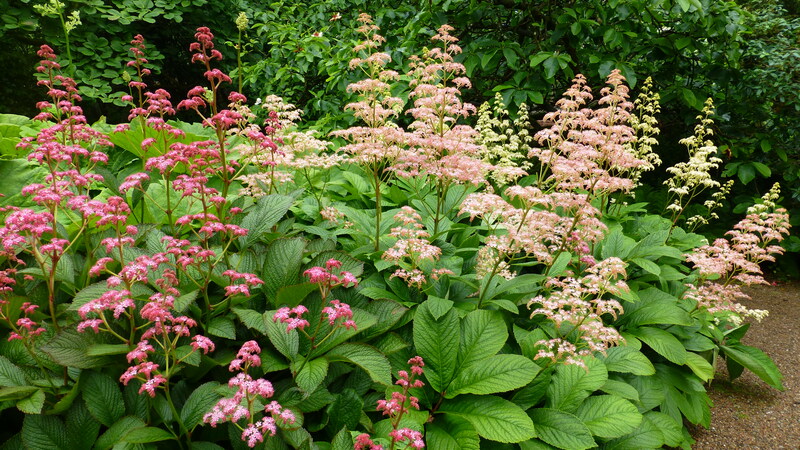 It is easy to grow and naturalizes quickly, increasing happily in the sun in most garden soils. So prolific are these plants that the gardeners here deadhead the flowers before the seeds set – a most necessary measure to help control its spread to parts of the garden where it is not wanted! The golden flowers make excellent cut flowers. Another mythical story refers to this plant. One of the greatest Greek storytellers was Homer and in his epic, ‘The Odyssey’, moly was the name of the drug used by Hermes to help Odysseus to become resistant to Circe’s magic spells. She had planned to turn Odysseus into a pig, as she had already done to some of his men. As with many good stories, once Circe realised that Odysseus was resistant to her magic, she fell in love with him and released his men from her spell. 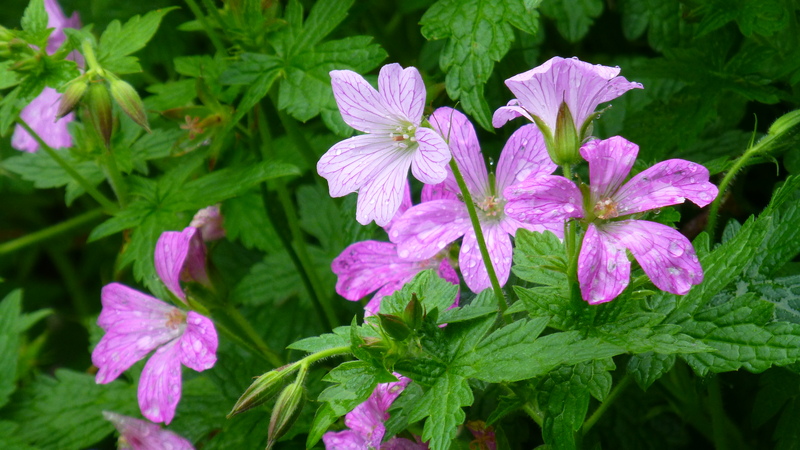 A plant much used in the Irish gardens that we visited is the Geranium, commonly called Crane’s Bill. With a mounding growth habit, interesting cleft leaves and often beautifully veined flower petals, Geraniums are a wonderful addition to any garden. With something over 400 species to choose from, gardeners can add a touch of colour and beauty with these plants that originate mostly in the eastern part of the Mediterranean. 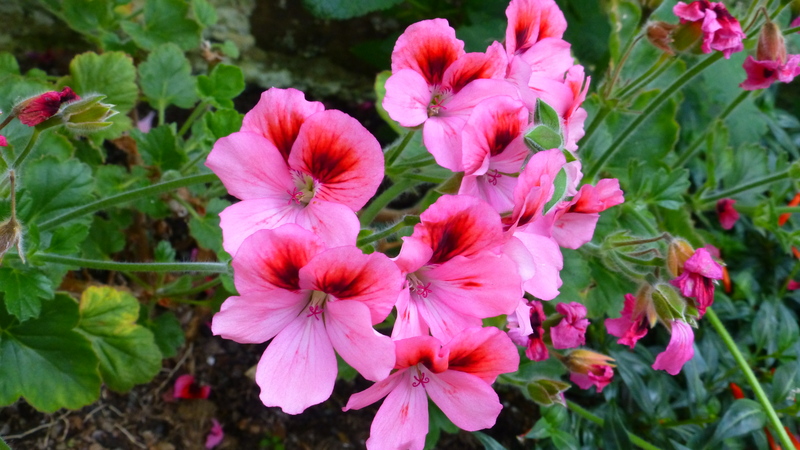 The name of this plant causes some confusion with another plant commonly called Geranium, the Pelargonium… the type that is grown in such profusion in window boxes in places like Switzerland and Austria. It appears that Linnaeus, the man who gave us the binomial way of naming plants, originally included both of these types of plants in the one genus, Geranium. In 1789 they were separated into two genera but still in the family known as Geraniaceae. But the common name geranium stayed in usage for both. Confusing? Yes. But there is a difference if we look at the flowers. Geranium flowers, as in the photo above, are radially symmetrical with five very similar petals. The next photo of a species in the pelargonium family, shows flowers that have two upper petals very different from the three lower petals. The flowers do look quite different, it’s just the name that confuses. In this garden the true Geranium species are grown in the garden beds… the Pelargonium species were grown in pots by the stables. A little further along the main path were a group of peonies, those wonderful flowers that look like they have put on diaphonous party dresses and are just waiting for a handsome prince to take them to a royal ball, there to waltz the night away! It was not a surprise to me to learn that the genus Paeonia is rather unique in that it is the only genus in the flowering plant family of Paeoniaceae, a name first used by Friedrich K L Rudolphi in 1830. I think he must have been a romantic at heart and fell under the spell of these beautiful flowers, just as I always do. They are unique. Peonies are native across much of the northern hemisphere in Asia, Southern Europe and Western North America but have now been bred to grow in many parts of the world, including our own garden in Canberra. 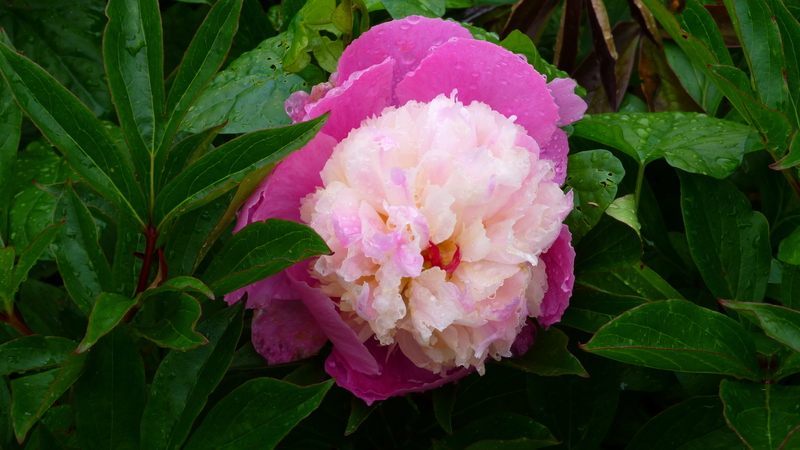 Another beautiful peony, staying out of the worst of the rain under an its ‘umbrella’ of foliage. And another. They are just so lovely. 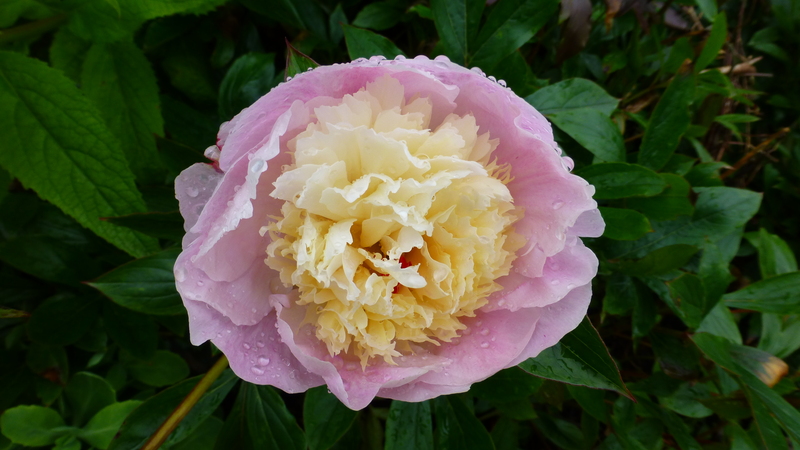 And here’s another flower-related Greek legend, this one is associated with the name Peony or (Paeony). 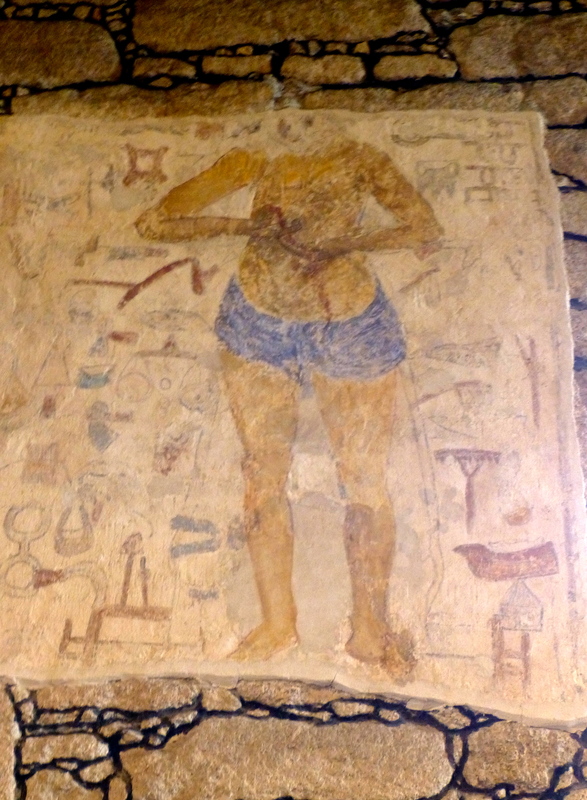 The story goes that Asclepius, the Greek god of medicine and healing had a pupil named Paeon. But Paeon must have been a little too bright for his teacher’s comfort and Asclepius became very jealous. However, before Asclepius could take out his wrath on the young Paeon, the great god Zeus stepped in and turned Paeon into a peony flower. 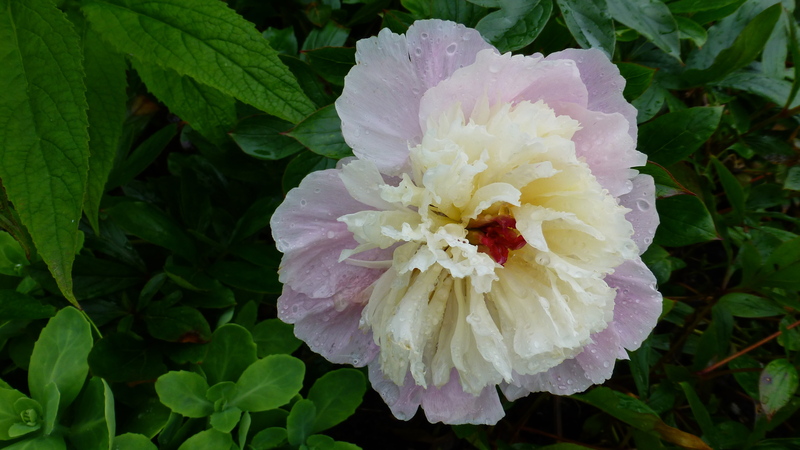 And, interestingly, Peonies have long been used in traditional medicines of Korea, China and Japan. And while mentioning the medicinal properties of plants, Comfrey, Symphytum sp, has been cultivated and valued for it’s medicinal uses for over 2,000 years by various cultures in its native areas of Europe and Asia. 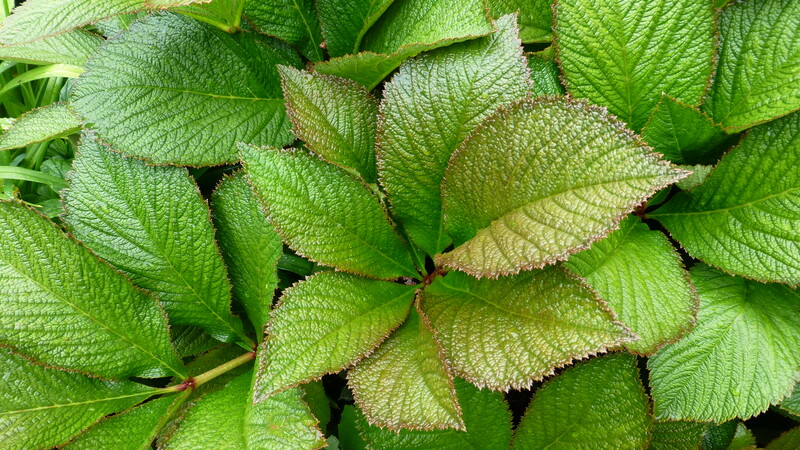 It is said to have been used as a blood coagulant, a treatment for maladies of the lung, and as a poultice to aid in the healing of wounds and broken bones. Consumed as a tea, comfrey is said to treat a variety of internal ailments. 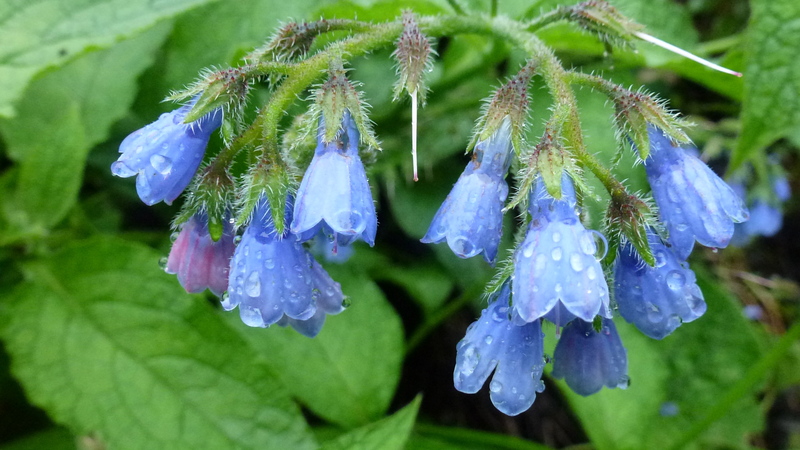 I just love its beautiful blue bell-like flowers that are even more lovely when touched by the rain… again, that bonus of walking in a garden in the rain. 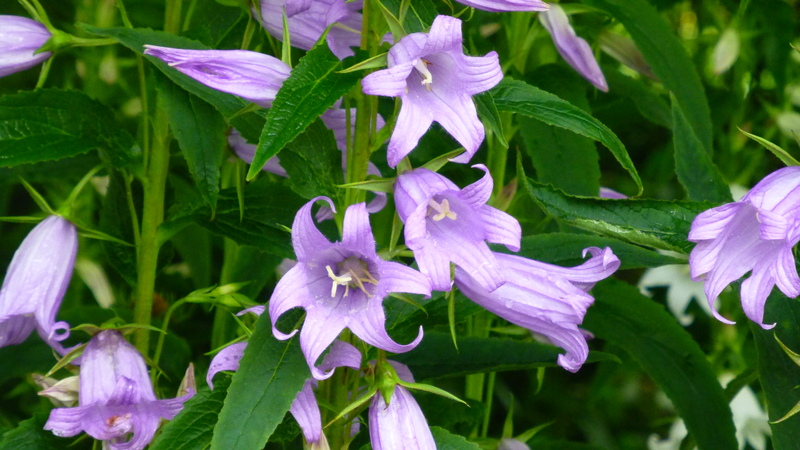 Another favourite genus of mine, grown in many gardens these days, is Campanula. And there are many stories associated with these delightful blue bell like flowers… especially in places like Ireland where they are connected to ‘the good folk’ – the fairies. It is said that people did not dig them out of their gardens – just in case they should offend the fairies who may sleep in these bells or use them as goblets to collect the dew. And in North America, the Haida Indians cautioned their children not to pick these flowers, or it would rain. Perhaps the Irish should start to pick these bells to STOP the rain! 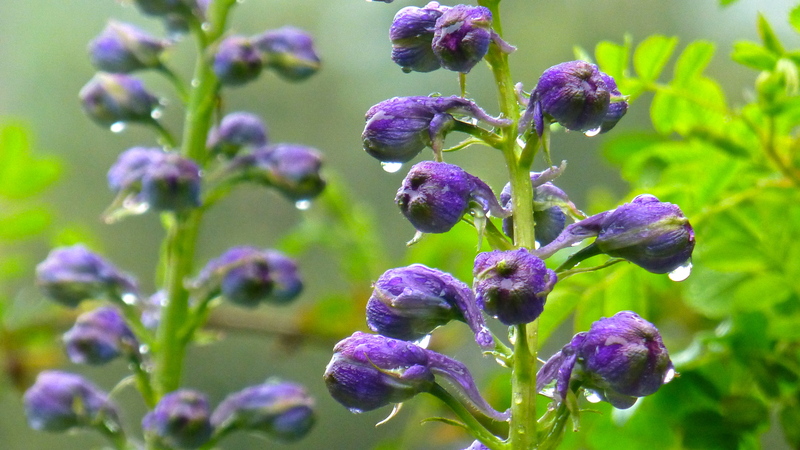 Raindrops on Delphinium sp. flower buds. 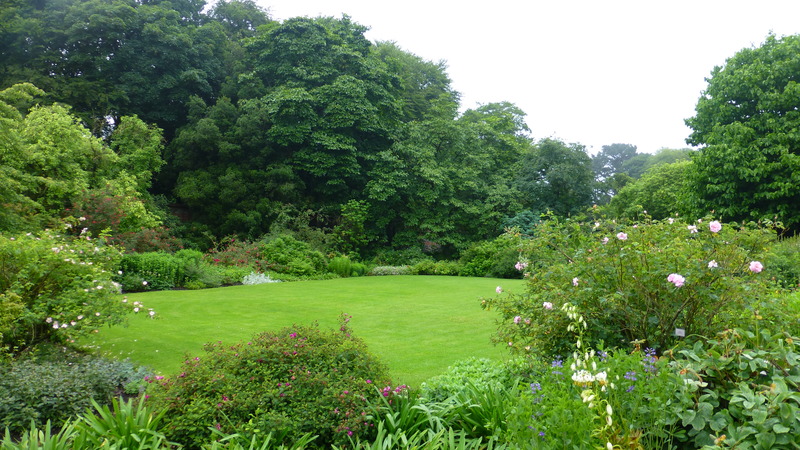 And rain it certainly did, while we visited this beautiful garden of Rowallane. As the rain grew heavier, we had to finally give up, take one more photo of raindrops on petals, this time on Delphinium buds, and make a quick retreat to the car. It had been a fascinating morning in a garden that is not only a wonderful legacy to Hugh Armytage Moore, but also a tribute to the gardeners of the National Trust who maintain this important garden with such care and diligence – and I daresay, with a great love for the plants they grow.